Poet/birder Chuck Stebelton continues his series of bird walks at Lynden this spring, and he's bringing friends! Please wear appropriate footwear and bring your binoculars if you have them; no previous birding experience required. Chuck Stebelton is author of An Apostle Island (Oxeye Press, forthcoming) and two previous full-length collections of poetry, most recently The Platformist (Cultural Society, 2012). His first book, Circulation Flowers (Tougher Disguises, 2005), was winner of the inaugural Jack Spicer Award. 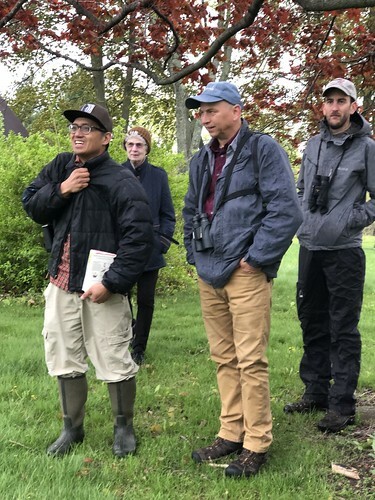 As a birder and Wisconsin Master Naturalist volunteer he has offered interpretive hikes for organizations including Lynden Sculpture Garden, Friends of Lorine Niedecker, Woodland Pattern Book Center, and Interfaith Older Adult Programs. He currently serves as Program Coordinator for Interfaith Older Adult Programs in Milwaukee and is a participant in Lynden's residency program.